Residents of the Southwest US will almost certainly face drought because of water loss in the Colorado River caused by global warming, according to scientists. By mid-century the water levels will drop by 5 million acre-feet, a new study says. Researchers from Colorado State University and University of Arizona are predicting the Colorado River will suffer up to a 55 percent reduction in volume by the end of this century, due to global warming. That will be concern to the 41 million people in seven states of the American Southwest that use the river’s supply for drinking water, and affect the water supply for six million acres of farmland. The scientists began investigating after noticing that recent Colorado flows were lower than water managers expected, given the amount of precipitation. The projected loss is equal to the amount of fresh water used by 2 million people a year. Researchers looked at the drought years of 2000-204, and found that 85 percent of the river’s flow originates as precipitation in the Upper Basin, the part of the river that drains portions of Wyoming, Utah, Colorado and New Mexico. The team found during 2000-2014, temperatures in the river’s Upper Basic were 1.6 degrees F (0.9 C) higher than the average for previous 105 years. “We’re the first to make the case that warming alone could cause Colorado River flow declines of 30 percent by midcentury and over 50 percent by the end of the century if greenhouse gas emission continue unabated,” said Jonathan Overpeck, professor geoscience and hydrology at ASU, announcing the discovery. The team synthesized 25 years of research about the effects of climate and climate change on the region, and how temperatures and precipitation affect the river’s flows. Water loss increases as temperature rise because plants use more water, and higher temperatures increase evaporation loss from the soil and from the water surface and lengthen the growing season. 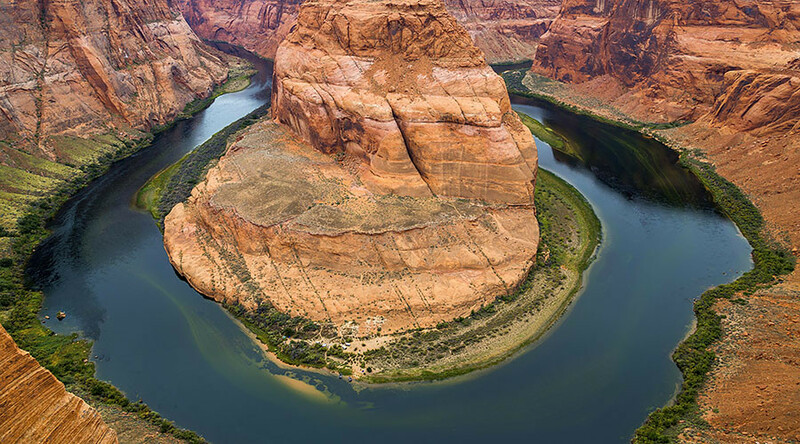 The research is the first to quantify the effects of temperature and precipitation on recent Colorado River flow, according to the authors Bradley Udall of Colorado State University and Johnathan Overpeck of the University of Arizona. “This paper is the first to show the large role that warming temperatures are playing in reducing the flows of the Colorado River,” said Professor Overpeck. The Colorado River Basin has been in drought since 2000. It supplies water to residents not just of Boulder and Denver but also of Salt Lake City, Las Vegas, Phoenix, Tucson, San Diego and Los Angeles. Previous research has shown the region’s risk of a mega-drought – one lasting more than 20 years – rises as temperatures increase. The river “irrigates close to six million acres of farmland, much of which it also created, through eons of silt deposition. It power the hydroelectric plants at the Hoover and Glen Canyon dams, is the principal source for the country’s two biggest man-made reservoirs, and supports recreational activities that are said to worth twenty-six billion dollars a year,” according to The New Yorker. The new study suggests Colorado River flows will continue to decline. Only “aggressive reductions in the emissions of greenhouse gases into the atmosphere” will help reduce the long-term decline in the amount of water in the once-mighty river," scientists said. The paper has been accepted for publication in Water Resources Research, a journal of the American Geophysical Union.